LycoTILL is an interactive and evolving database which allows search on-line of images and phenotype data of an EMS tomato (cv Red Setter) mutant collection. A large variability of mutant phenotypes, visually observed at both vegetative and reproductive stages of tomato M2 plants, are reported and available for the research community. 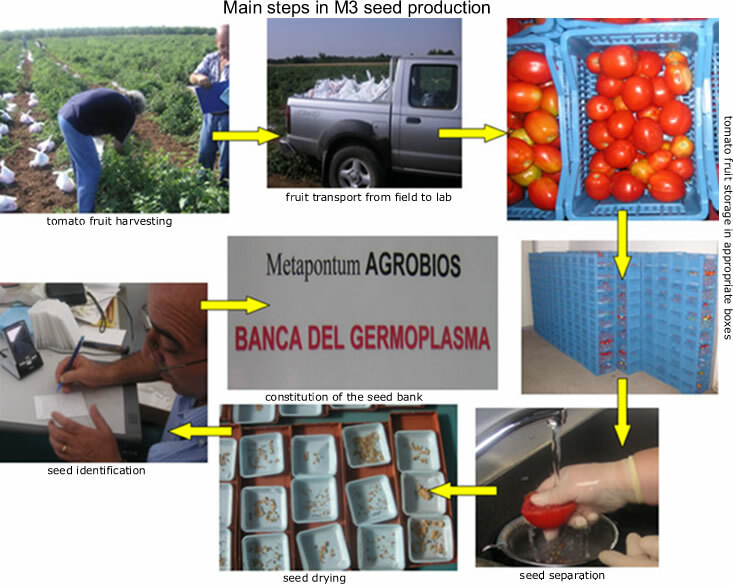 The database is managed and hosted at Metapontum Agrobios research center. Red Setter is the tomato cultivar we used, as genetic background, for the generation of a new mutant collection. It's a processing variety with a vegetative cycle of about 110 days. Red Setter is an highly productive cultivar and for its plant architecture is also suitable for mechanical harvesting. The Red Setter mutant population was produced by means of the chemical mutagen EMS (Ethylmethan sulfonate) and precisely by using two different doses (0.7 and 1%) of the mutagen. At present the tomato mutant collection includes 6677 M2 and 5872 M3 families. The development of the mutant population was tailored for the application of TILLING technology but since during seed harvesting, each mutant family was kept separated at both the M1 and M2 generation, this new genetic resource is suitable both for reverse genetic analysis (TILLING) and forward genetic studies. Seeds of the M2 and M3 mutant families are available for distribution and can be obtained upon the signing of a MTA document. TILLING (Targeting Induced Local Lesions In Genomes) is a new emerging technology that, for imparting desired traits in crops, utilises chemical mutagenesis for inducing variability and sophisticated molecular biological techniques to identify point mutations and alleles that are responsible for phenotypes of interest. Whereas the mutagenesis (e.g. chemical mutagenesis with EMS) is simple, the identification of interesting mutations depends on the knowledge of the nucleotide sequence of the gene under examination. In the last years the strength and potency of this reverse genetic strategy has been validated by its successful application in many organisms both plants (Arabidopsis thaliana, tomato, pea, wheat, maize, Lotus japonicus) and animals (zebrafish, drosophila) independent of their genome size. At Metapontum Agrobios a tomato TILLING platform has been established within national (ITALYCO) and European (EU-SOL) funded projects. In collaboration with URVG (INRA, Evry), the Red Setter TILLING platform has been set up (S. Minoia et al., BMC Res Notes 2010, 3:69). 5200 DNA samples have been prepared from individual families and 8 fold pooled for the molecular analysis. The identification of mutations in target genes are performed using the high sensitive mismatch-specific endonuclease ENDO1 (K. Triques et al., The Plant Journal 2007, 51:1116-1125). Allelic variants of genes of interest can be searched at the Agrobios's TILLING platform.